By now we all know how great Green Tea is. It’s chock-full of antioxidants, it fights free radicals, detoxes the body and burns fat. It’s no surprise that Green Tea may be one of my favourite drinks, and if you haven’t had Green Tea flavoured ice cream before, girl you haven’t lived. So when The Body Shop launched their Fuji Green Tea range, you can imagine I was in my elements. It’d be difficult to pick a favourite, but if I really had to name one, it’d be their Body Scrub. As you can see from what’s left (which is not much), I’ve really been enjoying using this —especially post workout. Not only does it smell incredibly refreshing and relaxing at the same time. It’s a very fine scrub in a gel texture. It doesn’t aggregate or dry out my skin and I’m left with the most soft and smooth skin, ever. I’ve been using this 2-3 times a week and I’m dreading the day I’ll run out of this. Whereas I’m not a particular fan of TBS’s Body Butters in general, as I find them way too fruity and intense for my taste, their Fuji Green Tea scent has completely changed my view on them. The Fuji Green Tea Body Butter is a very airy, butter that is so easy to blend into the skin. It doesn’t leave my skin feeling wet or sticky and it leaves your body smelling delicious. In a subtle manner, that is. Something that may be the most exciting for Green Tea lovers/drinkers, must be their Bath Tea. Yes, you read that right. Bathing in Green Tea is a thing now. 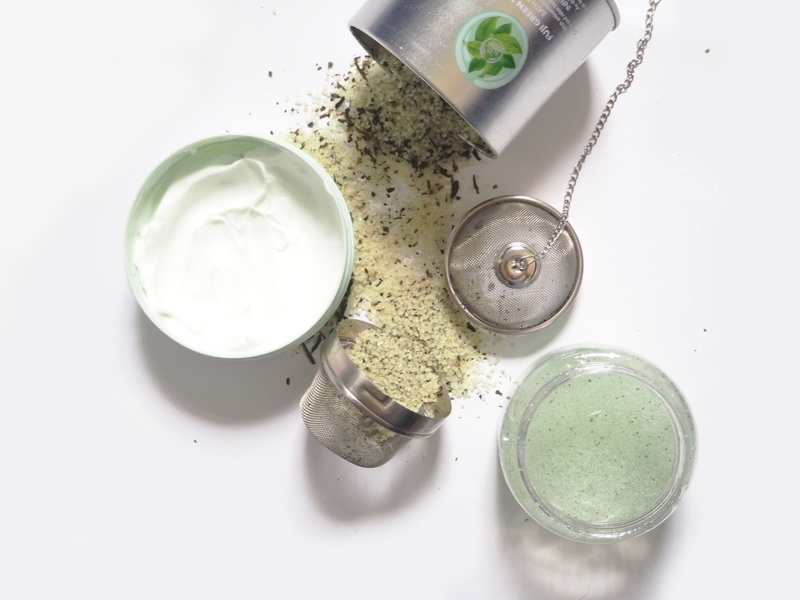 It actually contains real Green Tea leaves, combined with some bath salts, which are infused with Aloe Vera, Citrus… You get the gist. There’s a Bath Infuser, which helps keeping all the tea leaves and goodness together, without making cleaning your bath a nightmare. I’m not sure why this doesn’t come with the product, but it’s made bathing so much easier. I can imagine this being perfect to start your morning with, but I personally like to use their Bath Tea as a way to unwind and relax from a busy day. And for those really intensive days when I’m just too tired to do anything, I add a generous amount of this in my foot baths. Believe me or not, but it’s actually sleep inducing. And that comes from an insomniac.